Juno Beach was the code name of one of the five main landing sites of D-day. 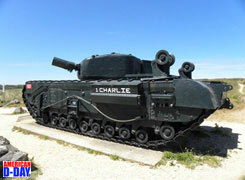 It was situated between Sword Beach and Gold Beach. It is also known as the Canadian beach, as it was assigned to the 3rd Canadian Infantry Division. Juno Beach stretched from Saint-Aubin-sur-Mer on the east to Courseulles-sur-Mer on the west. The 3rd Canadian Division was to assault the coast between Graye-sur-Mer to Saint-Aubin-sur-Mer where Juno Beach was divided into two sectors, "Mike" to the west, and "Nan" to the east. The 7th Brigade was to land and control Mike Sector. The 8th brigade landed on Nan sector with No. 48 (Royal Marine) Commando. The 9th Brigade remained afloat in reserve. Once ashore, the division was to link up with the British on Sword Beach and drive forward to the intermediate and final objectives.